Survivor Diet Challenge: Day 35 - Soft Shell Crab Delight! I was at work all day today and planned to put the killie trap out on my way home. I am going to try another fluke fishing mission with Dad tomorrow afternoon. Well, as I threw my trap in the water near the boat ramp I looked down on one of the pilings and saw a nice big crab attached to it. I was pretty hungry too so I drove home really quick to get my crab net. It was still there when I got back and I carefully, yet skillfully scooped him up. 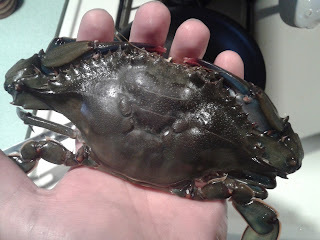 Right away I could tell that this was a softshell crab as it went kind of limp in the net. Even better! This was going to make a GREAT meal for me tonight! To prepare the crab, I cleaned out all of the undesirable parts and seasoned it up for the saute pan. I had to cheat a little here because I really wanted this done right. I had about 3 eggs left so I used one of them to egg dip the crab after dusting it with a little flour. And although I did not have any more of "my" breadcrumbs left from my past loaf of bread, I justified the use of borrowed breadcrumbs because Ty had eaten a lot of my own breadcrumbs when I had them out last week. In the end I prepared a breaded and sauteed soft shell crab sushi hand roll with brown rice, some garden greens, rice seasoning and nori wrap - served on a bed of lettuce. Man I'll tell you this was the BEST meal I have eaten (on or off the SDC) for a long time! It was fantastic. I was able to make two hand rolls packed full of crab and there were even some leg pieces left over for the salad portion. I also added a little soy sauce and wasabi dipping - not necessarily on the SDC menu I know - but it really rounded off this meal and made it that much better. I was in heaven. I also had a few freshly picked strawberries for dessert to round it all off. Thank you mister crab. This is a great sign for things to come - this means that there are crabs out there now and it won't be too long before I give the newly baited trot line a try. A crab feast would be a GREAT finish to the SDC - maybe this coming weekend.